Forget giving your Dad the typical Father’s Day gifts, like a boring necktie or coffee mug. Instead, show your Dad how much you care with one of these awesome tech gifts this year. Help Dad make his home a little smart with this handy starter kit from Philips. The kit includes four LED light bulbs and a bridge that is compatible with Amazon Alexa, Apple Homekit, and Google Assistant. The soft white lightbulbs are Energy Star certified that can be controlled remotely from anywhere using the Philips Hue app. The best part about this gift is that it easily be expanded to include a variety of other smart home accessories, like dimmer switches or motion sensors. Check out the LED Starter Kit. The Amazon Fire really is the best tablet for the price, and the Fire HD 8 has been upgraded to include up to 12 hours of battery life, 1.5 GB of RAM, and Dolby Audio. And with Amazon Alexa built in, Dad can easily access everything the tablet has to offer, from listening to his favorite music or finding out about tomorrow’s weather. Dad can also enjoy hundreds of apps, books, and games on his new Fire. You can find the Fire HD 8 Tablet here. If your dad enjoys a long hike or a leisurely bike ride, this amazing water bottle is perfect for him. This BPA-free bottle is so much more than a simple water bottle. It can serve as a Bluetooth speaker, a speakerphone, a bright lantern, or an emergency light because it is equipped with a bright, flashing light that can RGB color cycle and a hands-free microphone. Check out the Hydra Smart Bottle. This handy device will turn any smartphone into a head-up display (HUD) with the use of a HUD app, giving your dad the option to use his smartphone as a navigation aid without distraction. The device enlarges a smartphone screen by 20 percent and its transparency allows for a clear view of the road while driving. It can be used day or night and offers other fun features, like a landmeter display for off-road driving and a speedometer. Find the HUDWAY Display here. A handsfree speaker that you can control with your voice, the Amazon Echo is one handy device. Your dad will love the Dolby processing that provides an immersive sound throughout the room. But this speaker isn’t just for music. Just ask Alexa to make calls, get the latest sports scores, hear today’s headlines, and so much more. With seven microphones and beamforming technology, the Echo is set to respond to Dad’s requests no matter where he is. You can find the Amazon Echo here. 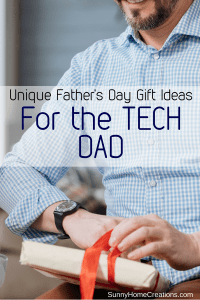 This tech gift is perfect for the active Dad. Not only does it feature four lighting modes (white, red, red/white strobe, and white point), it can also be used as a USB charging station for a backup phone battery. It’s perfect for camping and hiking because it can be clipped directly onto clothing or packs and comes with a handy bike mount. This small light packs a punch at 135 lumens of light and can burn up to 52 hours. And you can make a lasting impact with your purchase – a portion of every sale gets reinvested into the company’s work to bring clean cooking and energy to families across Africa and India. If your Dad loves music, he needs these awesome headphones. They feature soft synthetic leather ear pillows and a battery that lasts up to 10 hours. The handy onboard microphone and remote will allow him to make calls, control the headphone volume, and navigate through his playlist with ease. And the Bluetooth functionality makes it easy to take his music everywhere without any annoying wires to get in the way. Go here to see the Skullcandy Bluetooth Wireless Headphones. Active Dads will love this awesome tech gift. The sleek device snaps onto his wrist and tracks his health and fitness throughout the day, synching wirelessly and automatically to hundreds of iPhone, Android, and Windows devices. Whether he wants to count his steps throughout the day or track his sleep throughout the night, your Dad will love tracking his healthy habits in the palm of his hand. He can even create challenges with friends and family through the connected app. Click here to see the Fitbit Flex 2. For a Dad who is always forgetting to charge their phone, this tech gift is a lifesaver. A fully-charged PowerStation will provide three charges to a smartphone or one charge to a tablet. It features two USB ports to charge multiple devices and the sleek pocket-size design makes it easily portable. Each battery pack is triple-tested before it’s shipped, so you know you’re getting a quality product every time. You can find the Mophie PowerStation here. Give your Dad the gift of entertainment this Father’s Day with the Amazon Fire TV. This awesome tech gift will give him access to thousands of movies and TV episodes with the click of a button. With a powerful quad-core processor and 4K Ultra HD, there’s no better way to watch TV. Check out the price of the Amazon Fire TV here. I hope you can find your Dad the perfect gift that he loves. If you liked this article, I’d love for you to “PIN IT“!